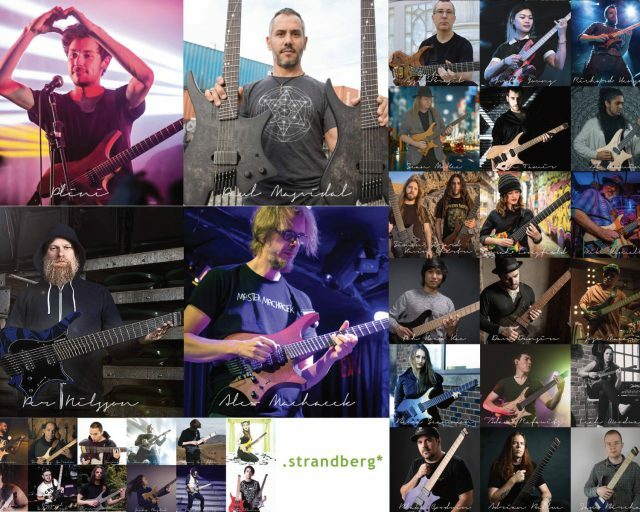 When .strandberg* was “born” in 2007, it wasn’t out of nothing. 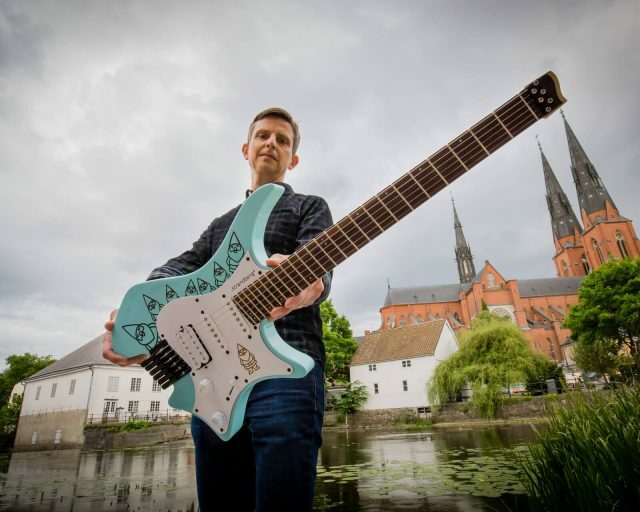 I (Ola Strandberg) had built guitars since the early 80s, although not actively since the mid 90s. When I, as a young lad, played in a variety of bands growing up, I prefered having a tremolo. And when I got my hands on a used Hohner Steinberger copy and reused the tremolo for my own “Strandberger” guitar, this became my absolute favorite guitar. The tremolo could be locked in place, providing the best of both worlds, with either fixed bridge or floating tremolo. And the guitar itself was smaller than conventional guitars with a headstock and seemed to just make sense. So when it was time to get started again in 2007, making a headless guitar was one of the first parameters going in. As I started researching the market for hardware for headless guitars, it turned out that there was practically nothing around. The best resource I could find for information was a blog called buildingtheergonomicguitar.com, and it was here that the idea of creating an ergonomic guitar was hatched. I designed a concept called the “Ergonomic Guitar System” or EGS, that consisted of headless hardware, replacement necks, and complete guitars. Just doing the hardware kept me occupied for several years, so meanwhile, the guitar ideas kept evolving and the replacement neck idea was scrapped. An important aspect of an ergonomic guitar is low weight. Removing conventional tuning machines cuts weight. Another important aspect of any guitar is good balance. To be able to create a lightweight guitar (i.e. with a light body), the only way to achieve good balance is to also remove weight from the headstock, and removing the tuning machines is a great way of doing this. The guitar becomes more compact and takes less space when traveling. The lack of headstock makes it easier to play at a train or tour bus for example, by not hitting the window or extending across the aisle. The lack of weight at the headstock means that if the guitar should fall down, there is much less momentum being built up, and the odds of surviving the fall without damage are better. When tuning the guitar, you can fret notes with the fretting hand and comfortably access the tuners with the picking hand. 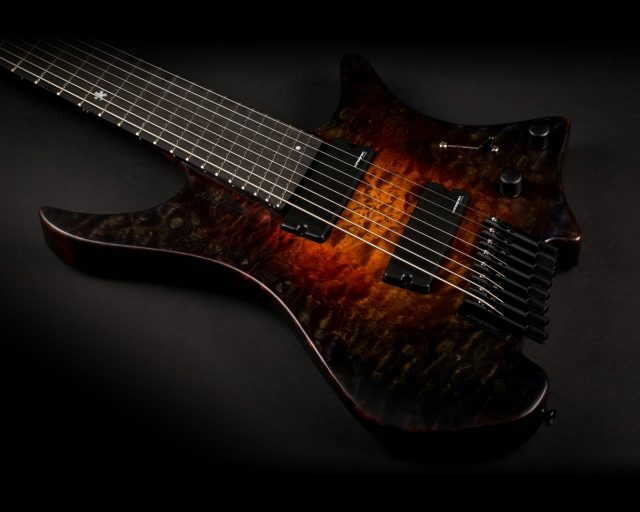 It does give the instrument a different aesthetic than a conventional guitar, and there is one less element to play around with when designing it. Many people think it looks “weird” with no headstock, but many come around eventually. 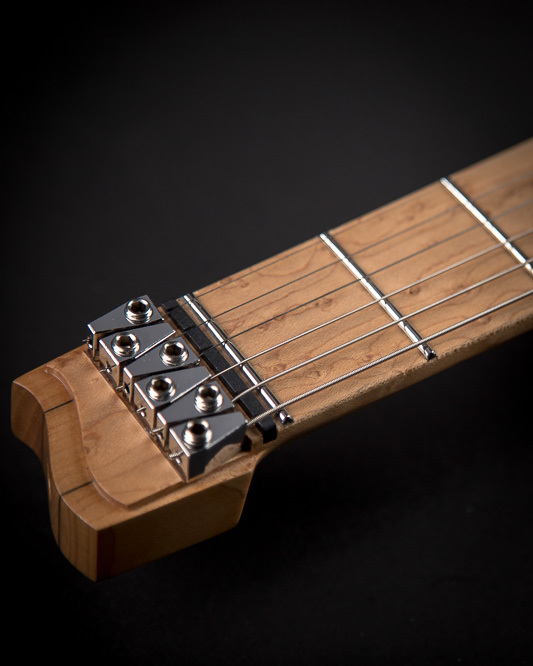 With less mass at the headstock, some people experience so-called “headless wiggle” – that when pressing the neck between thumb and fingers, it moves (too) easily back and forth, which can require some getting used to. 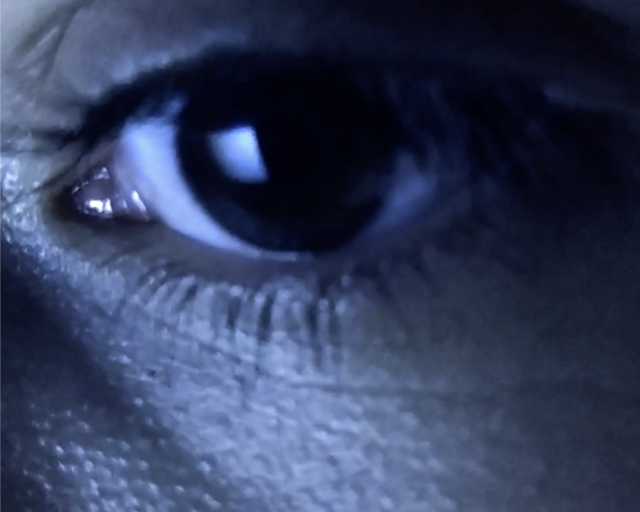 We believe that the benefits outweigh the drawbacks greatly of course, but only you, the player, can decide what is best for you. Our hardware, which is the foundation of the entire EGS guitar concept, is now in its 5th generation. To the right, you can see some of the evolution.